Ashwell Prince frustrated Northamtonshire with his batting skills today, but Steven Crook insists his side are not out of the match just yet. Northamptonshire may be without David Willey this week, but his absence wasn’t felt with the bat. Steven Crook came into the side and smashed 91 to continue a remarkable run of scoring from the number eight position. The pattern of Northants’ season has been the top order making starts but not kicking on, and again they looked precarious placed on 197-6 overnight. Crook’s 91, however, as well as 57 from Adam Rossington and a last wicket stand of 52 allowed them to reach 385. Crook has had to bide his time in the second team so far this season, but has been in form with runs and wickets. Although disappointed not to make his return to the side, with what would have been only his second first-class century, he said he was glad to make a positive contribution. “I’ve been around for a while now and sometimes you play and sometimes you don’t, it’s just one of those things really in sport,” he said. “So it’s been a little bit frustrating but I knew that my chance would come. I’ve just got to grab that chance and do my best. “Today with the bat it’s worked out pretty well, so as long as I can keep contributing to the team I’m happy with that. “Sometimes you get them [centuries] and sometimes you don’t, and more often for me I don’t get them. It’s pretty frustrating but it was nice to get some runs and get us in a good position in the game. Northants reduced Lancashire to 3-2 in reply but Ashwell Prince came to the visitors’ rescue with a classy unbeaten 104 as the hosts recovered to close on 216-4, 169 runs behind. Prince has now scored 361 undefeated runs since Northants last dismissed him. Crook admitted the South African’s quality, but said Northants were frustrated not to be able to take a couple of half chances he offered. Despite Prince’s century, Crook believes Northants remain in a good position, and with the pitch showing signs of uneven bounce, is confident they can strike early in the morning. “He’s a good player, he’s done it time and time again at every level he plays at so it’s pretty frustrating. We had a couple of chances to get him out but we couldn’t quite take those. “But I think there’s a little bit in there if we get the ball in the right area to give us a bit of something to look forward to tomorrow and hopefully put a few more wickets on the tally. “It’s a good wicket to bat on, I think it might go a little bit up and down over the next couple of days but you’ve got to be right on the money. If you’re not you can go around the park. Prince came to the wicket after just 17 deliveries of Lancashire’s innings following the early dismissal of Luis Reece and Alvaro Petersen. He praised his team mates for the support they provided, first Paul Horton in a third wicket stand of 112, and then an unbroken 77 with Alex Davies. 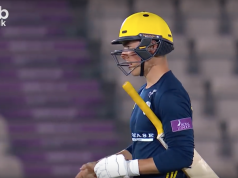 Davies has made 89 and 99 in his last two innings, and Prince said he liked the look of the 20-year-old wicketkeeper, who has taken the opportunity to begin the season with the gloves with Jos Butler on England duty. “I think obviously starting with losing two early wickets, in the end it’s a good day,” he said. “I thought Horton played well again today, and that partnership was crucial after the two early wickets. “I thought Davies played really well again this afternoon, he’s a good young player, a gutsy young player and he’s aggressive as well in playing his strokes and very positive so I thought they played really well.